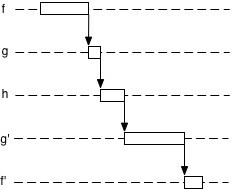 This asynchronous programming style is called continuation-passing style (CPS). The synchronous programming style is called direct style. The name CPS is due to the fact that you always pass a callback as the last argument to functions. That callback continues the execution of the function, is the next step to perform. It is thus often called a continuation, especially in functional programming. The problem with CPS is that it is contagious, an all-or-nothing proposition: loadAvatarImage uses CPS internally, but it can’t hide that fact from the outside, it must be written in CPS, too. The same holds for everyone who invokes loadAvatarImage. This section shows a few techniques that make it easier to translate code from direct style to continuation-passing style. The following code contains a simple for loop. Let us convert it to CPS in two steps. The first step is to use recursion for iteration. That is a common technique in functional programming. The following code is still in direct style. Now it is easier to convert the code to CPS. We do so by introducing a helper function forEachCps. There are two interesting changes: The visitor at (*) gets its own continuation, next, which triggers the next step “inside” forEachCpsRec. That lets us make CPS calls in the visitor, e.g. to perform an asynchronous request. We also have to provide a continuation done at (**) to specify what happens after the loop is finished. If we slightly rewrite forEachCps, we get the CPS version of Array.prototype.map. mapCps is used as follows. Variation: parallel map. The sequential version of mapCps is not as efficient as it could be. For example, if each mapping step involves a server request, it sends the first request, waits for the result, sends the second request, etc. Instead, it would be better to send all requests and then wait for the results. Extra care has to be taken to ensure that they are added to the output array in the proper order. The following code does all that. At (*), we must copy the current value of the loop variable i. If we don’t copy, we will always get the current value of i in the continuation. For example, arrayLike.length, if the continuation is invoked after the loop has finished. The copying can also be done via an IIFE or by using Array.prototype.forEach instead of a for loop. Given the following direct style function that recurses over a tree of nested arrays. Hence, if n < 0 then both success(-n) and success(n) are called. The fix is easy – write a complete if statement. It takes some getting used to that in CPS, the logical control flow continues via the continuation, but the physical control flow doesn’t (yet). CPS reifies “the next step” – it “turns it into a thing” (the definition of “to reify”) that you can work with. In direct style, a function is powerless over what happens after its invocation, in CPS, it has complete control. A so-called “inversion of control” happened. Let’s take a closer look at the control flow in both styles. Direct style. You call a function and it must return to you, it can’t escape the nesting that happens with function calls. The following code contains two such calls: f calls g which calls h.
Continuation-passing style. A function determines where to go next. It can decide to continue “as ordered” or to do something completely different. The following code is the CPS version of the previous example. CPS allows us to immediately exit the loop at (*). In Array.prototype.forEach, we cannot do that, we have to wait until the loop is finished. If we rewrite compare in CPS then it automatically returns for us from the loop. That is quite astonishing. To achieve a similar effect in direct style, we would need exceptions. With CPS, you can even implement exception handling in the language – there is no need for a special language construct. In the following example, we implement a function printDiv in CPS. It calls the CPS function div which might throw an exception. Hence, it wraps that call in tryIt, our implementation of try-catch. To make exception handling work, every function needs two continuations; one for successful termination and one if a failure happens. The function try implements the try-catch statement. Its first argument is the try block which has its own local versions of the success and failure continuation. The second argument is the catch block which again has local continuations. The last two arguments are the continuations that apply to the function as a whole. The CPS division div throws an exception if the divisor is zero. And now the implementation of exception handling. Note that the continuations of the catch block are statically determined, they are not passed to it when the failure continuation is invoked. They are the same continuations that the complete tryIt function has. If we implement generators via CPS, the distinction between the generator function and the generator object becomes more obvious. First, let’s write the generator as a function countUpCps. The constructor for generator objects can be implemented as follows. Note how we store the current continuation of the generator function inside the object. We don’t pass it on. CPS is a popular intermediate format for compilers of function languages, because many control flow constructs can be elegantly expressed and tail call optimization is easy. When compiling to a language without optimized tail calls, one can avoid stack growth via a technique called trampolining. The idea is to not make the final continuation call inside the function, but to exit and to return the continuation to a trampoline. That trampoline is simply a loop that invokes the returned continuations. Hence, there are no nested function calls and the stack won’t grow. For example, the previous CPS code can be rewritten as follows to support a trampoline. The trampoline picks up the returned arrays and performs the corresponding function call.